Join us for our March workshop! 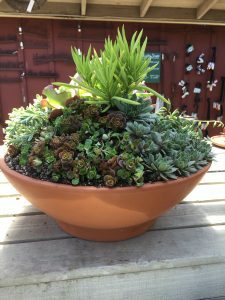 One of our instructors will guide you through the steps to create this fun 3D succulent planter. The cost of this workshop is $75. This includes all instruction and materials. Buyer’s Club members get 10% off! The 10 AM session of this workshop has SOLD OUT. We have added a second session at 2 PM. Join us as our staff guides you through the creation of a unique piece of garden art! Each guest will design their own planter with driftwood and succulents.